In 1913 Protestant missionaries working in Mexicobrought a severely wounded revolutionary soldier tothe United States where doctors saved his life, buthad to amputate one leg. The solider was youngAlberto Rembao. He went on to become one of the keyarchitects in the development of a socially consciousLatino Protestantism in the generation precedingliberation theology. Some writers accuse Rembao andhis generation, the so-called liberal phase" ofLatin American Protestantism of acquiescing to whiteAmerican missionaries and focusing on reaching LatinAmerica's elite with liberal bourgeois values and autopian social gospel. This book shows that Rembaowas a more complex figure. 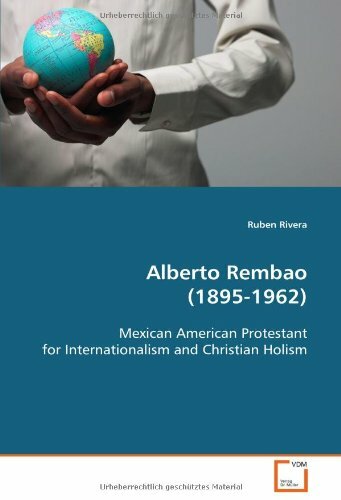 Previously unexplored butcritical for understanding Rembao are the ideals ofinternationalism and renewed social concern thatarose after World War I and became central tomainline Protestant missions and other organizationswith which he worked. These ideals led Rembao topromote holistic aspects of Christianity toward abetter world of peace fraternity and justice. Inthe process he challenged undemocratic politics racist U.S. immigration policies paternalisticmission practices and more." Ruben Rivera received his PhD from Boston University and teachesthe history of Christianity and Latin America atBethel University in St. Paul, Minnesota. He also engages inracial reconciliation work, and lives with hiswife Anita in Minneapolis.